On Thursday 14 December 1939 the INVERLANE was on passage from Abadan for Invergorden with 12,694-tons cargo of fuel oil. She was some miles off the Tynemouth when she detonated a German-laid mine. It caused an almighty explosion, which ripped through the ship leaving three crew members missing from her complement of forty, with one dead on board and many more seriously injured. Eventually, due to bad weather and poor visibility she was abandoned to the elements and left to sink. However, for thirty-six hours she drifted unseen, over a distance of twenty-six miles. Two days later, on the Saturday, the Sunderland Echo's headline read: 'GHOST SHIP COMES ASHORE AT DAWN IN SANDY BAY ON THE NORTH EAST COAST.' A clearance diver called Jim Devlin of Gateshead recalled that she burned for five days and was used as a marker at night by the German bombers. Jim was given the job of inspecting the wreck with his salvage boat STARLING. However, he had to wait until the fires had burnt out and the hull cooled sufficiently to inspect her. He found that she was down by the stern and had broken her back, the combined result of the exploding mine and the shallow water she was sitting in. After Jim's inspection, the authorities wrote her off and the ship was cut in two halves, with the tanker section, the fore-part, being taken to South Shields for repairs. In July 1940 she was towed to the Hughs Bolckow Shipbreakers Co., Ltd., at Blyth, for conversion to a blockship. Despite difficulties in obtaining supplies of cement and timber, the work of loading the 3,000 tons of heavy rubble, sand and cement was eventually complete and she was towed to Scapa Flow. Even that long voyage was not without incident, because two of the towing hawsers snapped, leading to the unhappy crew being replaced by naval personnel. She arrived at Scapa Flow on Christmas Day 1940 where she was designated as a spare blockship. 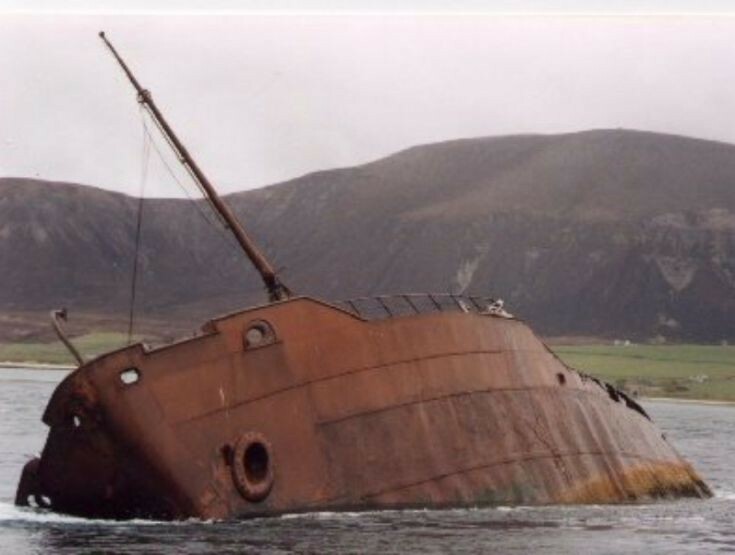 However, she was soon used for fire-fighting practice by the Royal Navy at Lyness for four years before eventually being sunk between Hoy and Graemsay in Burra Sound on Middle Skerry Reef in May 1944.